How can I upload media to my Personal Library using the Moovly mobile app? 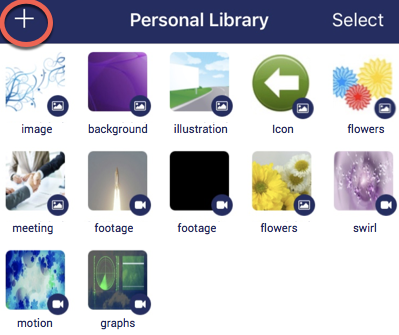 With the Moovly app, you can use your mobile device (smartphone or tablet) to take pictures or capture videos and add these to your Personal Library. You can also select pictures from your device storage (e.g. Camera Roll) and upload these to your Personal Library. The same applies to audio: you can record your voice or upload sounds from your device to use in your Moovly content. These media objects are synced via the Moovly servers between your Personal Library as you see it in the Moovly Studio editor and the mobile app. 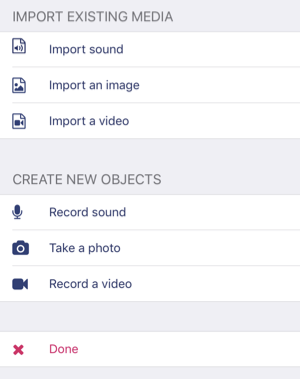 The first section of this screen lets you import any existing picture, sound or video on your device (e.g. images in your Camera Roll, pictures taken or edited with other apps etc.). Any media you add this way will immediately be synchronized with your Personal Library in Moovly Studio.